A contiguous body of ore is known as Pebble West where mineralization locally extends to the surface and as Pebble East where it is deeply buried. Pebble holds mostly low-grade ore, requiring a large-scale operation to economically recover it. Metallic minerals identified at Pebble include pyrite, chalcopyrite, molybdenite, and bornite, along with minor covellite, chalcocite, digenite and magnetite. In 2008, Pebble was estimated to be the second-largest ore deposit of its type in the world in terms of the value of the contained metal, slightly smaller than Indonesia's Grasberg Mine, which contains more metal in a smaller amount of ore than Pebble. Estimates have grown throughout the history of the project. By dollar value, slightly more than half of the value is from copper, with the remainder split roughly equally between gold and molybdenum. Byproducts of silver, rhenium, and palladium metals would also be recovered. The Pebble site is within Lake and Peninsula Borough, about 1,600 inhabitants as of United States Census, 2010, adjacent to the Bristol Bay Borough of about 1000 inhabitants and the Dillingham Census Area, 4,800 inhabitants. Some 7,500 people live largely rural lifestyles within or near the area downstream of the Pebble site. The populations of Lake Clark National Park and other parts of the Bethel Census Area are upstream of the site or in a different watershed. The populations in the area rely heavily on wild resources for subsistence, harvesting moose, caribou and salmon. Wild resources play an important part in the region's cultural heritage. For 2011, 91 million dollars were budgeted to complete the prefeasibility study, leading to permit applications in 2012. Environmental and engineering studies including 45,000 feet (14,000 m) of drilling to decide on mine design and a complete environmental baseline. The land is owned by the State of Alaska. Pebble Mines Corp. holds mineral rights for 186 square miles (480 km2) of the area, an area that includes the Pebble deposits, as well as other, less explored, mineral deposits. A sequence of mining companies and partnerships have owned the Alaska mining claims at and around Pebble since the initial claim staking by Cominco in 1987. The Pebble Limited Partnership is now 100% owned by The Northern Dynasty Partnership, which is a wholly owned Canadian-based subsidiary of Northern Dynasty Minerals, Limited. Three of the world's largest mining companies purchased shares of Northern Dynasty or became partners in the Pebble Limited Partnership through obligations to fund exploration and development. All have since divested their interests. A report released by Northern Dynasty in 2011 predicted profits for mine owners from a large-scale open-pit mine at Pebble, given appropriate assumptions about construction costs ($4.7 billion), scale (200,000 tons per day), lifetime (45 years), metal prices over that lifetime (2011 prices) and the mine design plan. The study assumes a slurry pipeline will deliver ore concentrate from the mine to a new port on Cook Inlet, and that trucks will haul ore concentrates to Cook Inlet. While the exact scope of proposed mining activities have not been finalized, the general outline of the plan is known. Pebble West would probably be mined as an open pit. The open pit might reach 2 miles (3.2 km) wide and several thousand feet deep. Most of the rock removed from the pit would become waste, amounting to as much as 10 billion tons. That material, along with allowed discharge chemicals, would be stored permanently in two artificial lakes behind embankment dams. The largest would be 740 feet (230 m) tall and 4.3 miles (6.9 km) long. Pebble East would most likely be an underground mine. Pebble would be similar to existing large copper porphyry mines such as Chuquicamata, Bingham Canyon and Ok Tedi, although the environmental setting and various technical considerations of Pebble distinguish it from these desert and tropical examples. Development and construction would consume years and cost billions of dollars. Required infrastructure includes miles of roads, bridges and powerlines with pipelines for fuel and rock slurries. The controversy over the proposed Pebble mine centers largely on the potential risk to the watershed, salmon and other fisheries. Mining opponents claim that the mine poses a significant and unacceptable risk to downstream fish stocks, and could cause an environmental disaster if built. Mining proponents claim that the mine can be developed and operated without significantly harming Bristol Bay area fish. In 2006 one poll reported 28% of Alaskans in favor of and 53% opposed to Pebble and another reported 45% of Alaskans in favor and 31% in opposition. A poll of Bristol Bay residents reported 20% in favor and 71% opposed. Fifty-seven percent of Alaskan voters in a 2008 statewide election voted against a ballot measure that would have essentially outlawed the project and perhaps similar developments elsewhere in Alaska. Organizations including the Resource Development Council, Alaska Mining Association, and the Alaska Chamber of Commerce support the project. The proposal has strong support among statewide elected officials. Opponents to the mine point out that it is about jobs—current sustainable fishing (world class fishery) vs. unknown future jobs which characteristically leave. Accidental discharge of process chemicals and byproducts, heavy metals, and acid mine drainage to the environment are realistic concerns in mine design and operation. They are dangerous to fish and other wildlife. Downstream salmon and freshwater fish species are vulnerable to mine-generated pollutants. A threat to the fish would amount to a threat to the regional subsistence lifestyle. The Bristol Bay Area Plan (BBAP) applies to about 12 million acres (49,000 km2) of state-owned uplands and lands beneath rivers and lakes in the Bristol Bay drainages, including lands at and in the vicinity of the proposed mine. The plan also covers about 7 million acres (28,000 km2) of state-owned tide and submerged lands. The suit alleged that the 2005 BBAP, which replaced the original 1984 version, drastically altered, without legal justification, the land-use designations, classifications and acreages defined in the 1984 plan; and that the 2005 plan failed to provide adequate protection for subsistence resources, sport hunting and fishing, wildlife habitat and other renewable resources. If successful, the suit will require ADNR to write a new area plan, a many months-long process involving much public input and review of draft versions, although ultimately, approval of an area plan is decided by the Commissioner of Natural Resources, an appointee of the Governor. As of Aug. 7, 2009, DNR had not filed an answer to the complaint. Nunamta Aulukestai et al. v. State of Alaska DNR,  was filed in Alaska Superior Court (Third Judicial District) on July 29, 2009, by Trustees for Alaska on behalf of the Bristol Bay Native organization Nunamta Aulukestai, former Alaska First Lady Bella Hammond, original Alaska Constitutional Convention delegate Victor Fischer and other individuals. The suit seeks "Declaratory and Injunctive Relief," asserting that the Alaska Department of Natural Resources repeatedly violated Section VIII of the Alaska Constitution, which specifically provides that there shall be, "...no disposals or leases of state lands...without prior public notice and other safeguards of the public's interest..."
The plaintiffs are seeking, among other things, an injunction voiding the project's existing permits, including water-use permits. The requested injunction was specific to Pebble permits and would not directly apply to other mining projects. The suit alleges that ADNR's "pattern of permitting," is defective because it was not sufficiently rigorous in determining that issuing a permit would best serve public interest, as demonstrated by a lack of documented scientific studies and by lack of public review and input, prior to issuing permits. A Declaration by one of the plaintiffs references the Commentary on Article VIII on State Lands and Natural Resources of December 15, 1955; "As requirements change and many tasks become routine, appropriate modifications can be made in procedures if rigid requirements are not specified in the Constitution itself." The suit also alleges that significant, and documented, adverse effects on land, water, and wildlife have already occurred as a result of drilling and other exploration activities at Pebble since 1989. In late 2009 the presiding judge rejected a State of Alaska motion to dismiss the case and also denied a motion for a preliminary injunction to stop mining exploration. A Petition for Review on the preliminary injunction decision was filed with the Alaska Supreme Court. In January, 2007 Senate Bill 67, introduced by Senator Gary Stevens, of Kodiak, proposed the establishment of a State Fish and Game Refuge covering about 7 million acres (28,000 km2) of state land in the Kvichak and Nushagak drainages (with the refuge to be named after former Alaska Governor Jay Hammond). It proposed that no uses incompatible with: fish and wildlife populations; commercial or subsistence food gathering; or recreation would be allowed in the refuge. The bill sought to close the refuge to new mining claims. Most significantly, the bill would have made illegal the storage or disposal of any quantity of, "industrial waste," thereby making it impossible to develop any industry, including mines, within the refuge. The bill died in the Senate Resources Committee. In August 2008, Ballot Measure 4, the "Alaska Clean Water Initiative," was voted down (approximately 57% against and 43% in favor) in that year's primary election. The measure was written to apply statewide (which the Constitution of Alaska demands). Supporters of the Measure argued that it would not affect any other mining operation. Opponents argued that it would have had serious, and unnecessary, adverse effects on the mining industry statewide. ^ "Pebble Project — Northern Alaska Environmental Center". ^ a b Mark Rebagliati (Northern Dynasty Minerals Canada); James Lang (Lang Geoscience Inc, Canada) (August 2008). "Geology and exploration history of the super-giant Pebble copper/gold/molybdenum". International Geological Society. Geological Survey of Brazil. ^ Detterman, R.L. ; Reed, B.L. (1980). "Stratigraphy, structure, and economic geology of the Iliamna quadrangle, Alaska" (PDF). U.S. Geological Survey Bulletin 1368-B. ^ Peter J. Haeussler; Richard W. Saltu (2004). "26 km of Offset on the Lake Clark Fault Since Late Eocene Time" (PDF). Studies by the U.S. Geological Survey in Alaska, 2004 U.S. Geological Survey Professional Paper 1709–A. USGS. p. 4. Retrieved 12 September 2014. ^ David Chambers (September 2007). "Pebble Engineering Geology Discussion of Issues" (PDF). Center for Science in Public Participation. Archived (PDF) from the original on 2014-09-13. ^ a b "USGS Resource Data File - Iliamna quadrangle" (PDF). USGS. 2004. pp. 1–117. ^ "Pebble's value keeps growing". Anchorage Daily News. 25 February 2008. Retrieved 12 September 2014. ^ "Northern Dynasty Minerals Ltd. - Pebble - Thu Apr 13, 2017". ^ "Sockeye Salmon - Species Profile, Range and Habitat". Alaska Department of Fish and Game. Retrieved 12 September 2014. ^ OurBristolBay (2009). "Our Bristol Bay - Bristol Bay Commercial Fishing". Retrieved 12 September 2014. ^ OurBristolBay (2009). "Bristol Bay Subsistence Use". Retrieved 12 September 2014. ^ Theodore Krieg; Molly Chytlook; Philippa Coiley-Kenner; et al. (2003). "Freshwater Fish Harvest and Use in Communities of the Kvichak Watershed, 2003, technical paper 297 see in particular, Figures 7 through 14" (PDF). Alaska Fish and Wildlife Services. Archived from the original (PDF) on 2009-05-10. ^ "SEDAR Application Error / Erreur – application SEDAR" (PDF). ^ "NDM Investor Handout" (PDF). 9 January 2008. Archived from the original (PDF) on 11 July 2011. ^ "Page not found - Equities Newswire". ^ "Northern Dynasty Minerals Ltd. - News Releases - Thu Apr 13, 2017". ^ "Northern Dynasty Minerals Ltd. - News Releases - Thu Apr 13, 2017". Archived from the original on 2011-07-14. Retrieved 2009-05-01. ^ "The Pebble Blog : Pebble won't apply for development permits in 2010 | adn.com". Archived from the original on 2010-02-23. ^ a b Northern Dynasty. "Exploration Lands". Archived from the original on March 25, 2012. Retrieved 2012-07-10. ^ SEC (February 25, 2011). "SCHEDULE 13G Under the Securities Exchange Act of 1934". SEC. ^ "Northern Dynasty re-acquires 100% ownership of southwest Alaska's Pebble Project - Mon Jul 28, 2014". Northerndynastyminerals.com. Retrieved 2014-07-28. ^ "Rio Tinto Increases Investment in NDM to Near Legal Agreement Threshold". ^ "Rio Tinto gifts stake in Northern Dynasty Minerals to Alaskan charities". 7 April 2014. ^ In latest blow to Pebble prospect mining giant Rio Tinto pulling out, Anchorage Daily News, Sean Cockerham, 7 April 2014. Retrieved 8 April 2014. ^ "Northern Dynasty Minerals Ltd. Company Overview". Northerndynastyminerals.com. 28 July 2014. Retrieved 28 July 2014. ^ "Northern Dynasty Minerals Ltd. - Board - Thu Apr 13, 2017". ^ "Hunter Dickinson - Directors - Thu Apr 13, 2017". ^ "Kopernik Global Investors, LLC discloses 6.17% ownership in NAK / Northern Dynasty Minerals Ltd". Fintel.io. February 13, 2019. ^ "Sizing Up the World's Mega Copper-Gold Projects - Resource Investor". ^ "Northern Dynasty Minerals Ltd. - Thu Apr 13, 2017". ^ a b Alaska Department of Natural Resources. "Pebble Copper-Gold Project". Retrieved 2007-01-06. ^ "Anchorage Water and Wastewater Utility Overview". ^ "Northern Dynasty Minerals: State of Alaska Approves Pebble Project Miscellaneous Land Use Permit". www.juniorminingnetwork.com. Retrieved 2017-04-11. ^ "Acid Rock Drainage and Metal Leaching at the Pebble Project, summary prepared by Dr. Kendra Zamzow". Archived from the original on 2016-01-19. Retrieved 2009-05-15. ^ "Fisheries Impacts at the Pebble Mine, text by William J. Hauser, Fish Talk Consulting". Archived from the original on 2009-04-17. Retrieved 2009-05-15. ^ "Water-Related Impacts at the Pebble Mine, Robert E. Moran, Ph.D". Archived from the original on 2009-04-16. Retrieved 2009-05-15. ^ "Page not found". Archived from the original on 2013-05-11. Retrieved 2017-04-13. ^ "Fishing for molybdenum," Economist, Nov 10 2007, 38-39. ^ "Pebble Mine Construction Now Estimated at $6 Billion". Archived from the original on 2009-02-05. ^ "Fact Seeht april 2011" (PDF). Archived from the original (PDF) on July 22, 2011. Retrieved June 13, 2011. ^ Yardley, William (August 23, 2008). "Vote in Alaska Puts Question: Gold or Fish?". The New York Times. Retrieved May 22, 2010. ^ Renewable Resources Coalition. "A Summary of Statewide Polling Results on Pebble Mine" (PDF). Archived from the original (PDF) on 2006-11-21. Retrieved 2007-01-06. 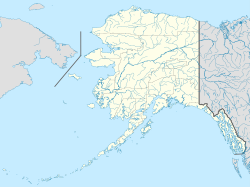 ^ Kenai Peninsula Clarion: " Dueling polls oppose, support Pebble Mine project." Retrieved January 23, 2007. ^ Renewable Resources Coalition. "Bristol Bay and Lake Peninsula Boroughs Pebble Mine Survey" (PDF). Archived from the original (PDF) on 2006-11-21. Retrieved 2007-01-06. ^ Renewable Resources Coalition. "Renewable Resources Coalition Home". Retrieved 2007-01-06. ^ Nunumta Aulukestai. "Nunumta Aulukestai" (PDF). Archived from the original (PDF) on September 28, 2007. Retrieved 2007-01-06. ^ Alaska Independent Fishermen's Marketing Association. "AIFMA Opposes the Proposed Pebble Mine" (PDF). Archived from the original (PDF) on 2007-01-01. Retrieved 2007-01-06. ^ Alaska Wilderness Recreation and Tourism Association. "Pebble Mine Policy Statement" (PDF). Archived from the original (PDF) on 2007-01-07. Retrieved 2007-01-06. ^ American Rivers. "Bristol Bay on 10 Most Endangered Rivers List for 2006" (PDF). Archived from the original (PDF) on 2006-12-15. Retrieved 2007-01-06. ^ Trout Unlimited. "Save Bristol Bay". Archived from the original on 2007-01-07. Retrieved 2007-01-06. ^ SPENCE, HAL. "Major jewelers oppose Pebble - Peninsula Clarion". ^ Institute of Social and Economic Research University of Alaska Anchorage. "The Economic Importance of the Bristol Bay Salmon Industry" (PDF). Archived (PDF) from the original on 2017-08-09. Retrieved 2018-02-04. ^ Protection Agency. "Liquid Assets 2000: Pay for Dirty Water". Archived from the original on 2008-05-15. Retrieved 2007-01-23. ^ "EARTHWORKS | Comparison of Predicted and Actual Water Quality at Hardrock Mines". Earthworksaction.org. Retrieved 2014-07-28. ^ "Pebbles Prospects Grow". Archived from the original on September 27, 2012. Retrieved January 11, 2013. ^ Alaska Republican Party. "Percentage of Resource Production Value Paid to State Municipalities from the Oil and Gas, Mining, and Fishing Industries" (PDF). Retrieved 2007-01-23. ^ "Bristol Bay Bourough Economic Overview, State of Alaska Dept Commerce and Economic Development". Archived from the original on 2004-08-24. ^ "ndmpebblemine.com". Archived from the original on 2007-10-12. Retrieved 2007-10-18. ^ "The Midas touch". Mother Jones. May 2006. Retrieved January 23, 2007. ^ Sarah Childress (Director) (2014-01-16). "EPA: "Alaska Gold" Mine a Threat to Salmon Fisheries". Alaska Gold- FRONTLINE. PBS. Retrieved 2014-12-14. ^ a b "EPA Continues to Deny Pebble Due Process - Alaska Business Monthly - July 2014 - Anchorage, AK". Akbizmag.com. 2014-07-18. Retrieved 2014-07-28. ^ Reynolds, Joel (10 August 2013). "Why EPA Needs to Block Alaska's Pebble Mine". RealClearPolitics.com. Retrieved 29 July 2014. ^ "Northern Dynasty Minerals: Pebble Partnership Reaches Settlement with US Environmental Protection Agency". www.juniorminingnetwork.com. Retrieved 2017-05-12. ^ "EPA proposes to withdraw Clean Water Act restrictions for Pebble Mine in Alaska's Bristol Bay watershed". EPA. July 11, 2017. Retrieved 24 October 2017. ^ Palin's hand seen in battle over mine in Alaska, New York Times, Michael Powell and Jo Becker, 21 October 2008. Retrieved 8 April 2014. ^ "Alaska Board of Fisheries Summary of Actions from March 07 Meeting" (PDF). Retrieved 2007-11-28. ^ "Bill Text 25th Legislature". ^ "Alaska State House Journal". Retrieved 2007-11-28. ^ "Pebble Backers say Fish Refuge Bill Actually Targets Mine". Alaska Journal of Commerce. Archived from the original on November 22, 2008. Retrieved 2007-11-28. ^ Alaska Law Review: Geoffrey Y. Parker, Frances M. Raskin, Carol Ann Woody and Lance Trasky, Pebble Mine: Fish, Minerals, and Testing the Limits of Alaska's "Large Mine Permitting Process". UPI: (April 6, 2008) "Alaska's Pebble Mine worries biologist"
Seattle Times: (Feb. 12, 2008) "Jewelers oppose Alaska mine"
Peninsula Clarion: (Feb. 13, 2008) "Major jewelers oppose Pebble"
Homer News: (April 15, 2009) "Leading UK jewelers say 'no' to Pebble"